I first had this soup at a pavement restaurant in Prague, served as it was just starting to rain (we were under umbrellas!). It was most comforting and warming. 1. 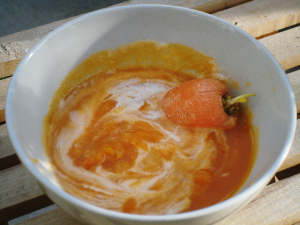 Warm the vegetable stock (vegetable stock may be made by adding a vegetable cube to water); peel and dice the carrots. Add to stock and boil until carrots are just soft. 2. Meanwhile peel the ginger root and grate finely. Add to the soup. Puree. Season to taste. If the mixture is too thick, add more stock; if it is not spicy enough, it is possible to add more ginger, or ground ginger. 3. Make sure soup is hot and pour into serving bowls. Pour a circle of cream into each bowl of soup and garnish with a sprig of parsley. The cream is most important as it smoothes the ginger and also makes the dish more attractive to the eye.